Zoll AED Plus Type 123 Lithium Batteries has been added successfully to your wishlist. The Zoll AED Plus takes Duracell Type 123 Lithium Batteries which are packaged in a storage sleeve containing 10 batteries. The Duracell batteries have a 5 year expiration date while the device is in stand-by mode and a shelf life of 10 years. 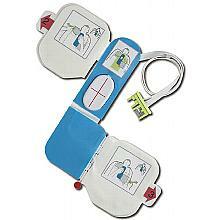 The AED Plus uses redundant circuitry, so if one set of 5 batteries fails, the other 5 are there for backup.